After a very casual, menswear-inspired outfit (which I didn't deem blog-worthy) on Monday, I went ladylike all the way on Tuesday. Very pretty, really feminine outfit! Very nice skirt, when I saw it I thought it was vintage, I love the pink lips too, it looks very nice with your red hair. i love your skirt and your necklace! so pretty. I love this look, the colours are fantastic. Definitely very ladylike!! Katy this is so cute!!!! can't get over this skirt...loooove those polka dots and how that tawny brown can get dressed up with so many bright colours. Fun statement necklace too. I really like the color combination of this outfit. I never would have expected that! OMG I love this polished, ladylike look Katy! So pretty. These colors look really great together. 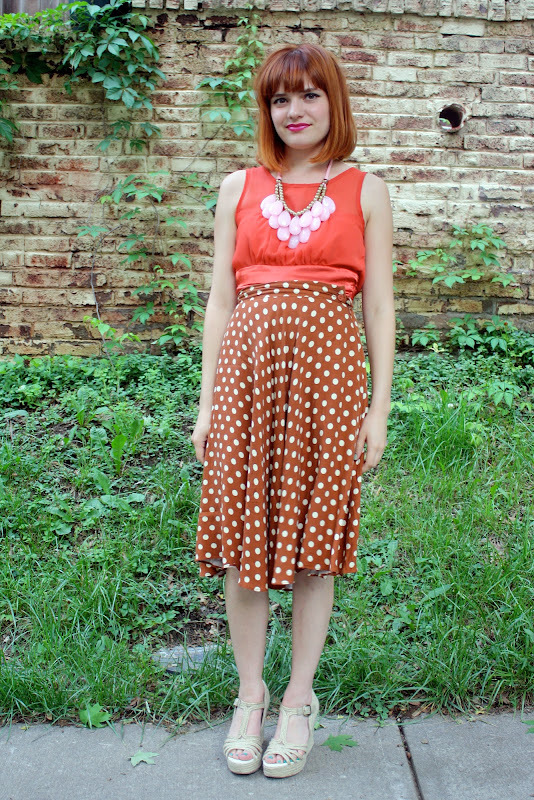 I'm really loving your dotted skirt too.